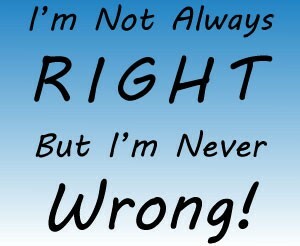 How many times today did you catch yourself either thinking or saying “I’m right!”? In our minds we always seem to be the one “in the right”! Have you stopped to think about your last conflict with someone, have you made an honest evaluation of the situation, and analyzed your own actions and words? What part did you play in the situation? Did you escalate it, instigate it, prolong it, remain unforgiving in it? Few people stop to think about their words, actions, and reactions. They just continue on as though they are always 100% in the right. (drivers do this a lot too!) And as though they are perfectly justified in their words, action, and reactions. Never apologising, nor forgiving! This is not the way of God’s righteousness! Be sure that the Lord will evaluate you motives for you! Best if you corporate in the process, it will go easier on you. Plus you just might learn something. And of course I speak to myself as well! Proverbs 16:2 HCSB All a man’s ways seem right to him, but the Lord evaluates the motives.